The Other Side blog: Gen Con recap: The name of the game is "D&D"
I did something truly special this Gen Con. Something that I would love to repeat. I played D&D with my family through the entire Con. One of the things I wanted to do with my boys was to play the history of D&D with them. I didn't get into every game I wanted, but I got in enough to make it count. I also wanted my wife to join in so she could give her unbiased opinion of the games. I have learned to trust her judgment on many, many things over the years. Part of the plan was that any XP, gold or magic the boys got in the games they could translate that over to the special 1st Ed Game we were playing at night. We played a D&D4 game on Thursday. It was a fun game where we all played Dwarfs. The DM was great and he played well with the kids. Thursday night I had a game of my own to play (which I'll discuss later). Friday was our Castles and Crusades game. I REALLY wanted to play this one after going on and on so much about C&C a while back. I picked up my new copies of the 5th printing of the Players Handbook and Jason Vey's amazing Amazing Adventures. The game we played was also a lot of fun. Again we had a great GM...er Castle Keeper, and in this we all played Assassins. My youngest loved it. Friday night we rolled up characters for 1st Ed AD&D!! They rolled up two each, and these are the children of the Dragonslayers (their current 3.x game). That took us till midnight since I had to look a lot of things up and we were sitting on the 2nd floor of the JW Marriott and everyone had stop by and comment on what we were doing. Saturday we played D&D5/Next. If I would have known we were making characters I would have gone into it with a different mindset. But it worked out well and character creation was a snap. Really. It only took me 30 mins to do my character and help out my wife and two kids. I playtested the Warlock and I like it so far. The game itself was fast, I mean really fast. I am going to come back to that in a sec in fact. Saturday night we played AD&D 1st ed. I had the boys go on a quick adventure into Castle Quasqueton from B1 In Search of the Unknown. The boys had some great rolls and they even took out some orcs, zombies and a group of kobolds. The boys made their objective (which happened to be a on sheet of paper I wrote on when I ran this in college around 1988-9 or so), find a missing witch (Marissa) and bring her back. I hinted there was an evil cult at work (cause that was what I was doing in 88) and the boys ran with it. Now this cult is "infiltrating" the lands and they now have to put a stop to it. I might run with that. Quite by accident one of the common elements in the D&D5/Next playtest and my AD&D game on the same day was the party (6 and 5 characters respectively) fought 4 kobolds. The combat for each ran very, very similar. In both cases it was fast with hit points flying everywhere and characters on the verge of death. 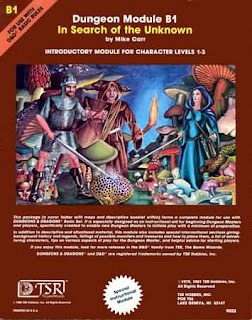 I can say that in at least this respect D&D5 is closer to old-school play than 3 or 4 was. It dawned on me at one point or another while playing Saturday night. I was playing AD&D. With my boys. At Gen Con! I play a lot of D&D with them and I have played a lot of AD&D over the years, but this felt special. This felt like the best thing I could do then and there. I have no idea what I am going to do with D&D5 when it comes out. At this very same Gen Con Wizards of the Coast had announced that D&D5 would not be out till 2014. That is a very good year in my mind. Still gives us time to play some 4e AND be out in time for the 40th anniversary of D&D. WotC also announced that previous editions would be made available again via e-book format of some sort. There were copies of 1st Ed for sale at Gen Con and we all also picked up a full set of D&D "Drow" dice. For me there is no debate. D&D still reigns as king at Gen Con. So envious of you - that's the dream, right there: "playing D&D, with your kids, at Gen Con". Interested to hear what you had to say about 5th Ed and with the long lead time I'll hopefully be fully immersed in my next campaign before I have to consider whether to switch horses mid-stream. From what I've read of the playtest material I suspect I'll be more inclined to simply swipe the bits of 5th Ed I like and integrate them into my game. It certainly looks as though - mechanically - that'll be easier to do that 3.5/4th Eds. Hey, I said hello while you were playing B1! Right by the elevators in the JW on ... Sat night!